What Does 10 Day Blood Cleanse Consist Of? This systemic cleansing may also benefit the skin, helping maintain clear skin and complexion. * Vegetarian capsules (50 capsules). This supplement tea aids in cleansing the blood and lymphatic fluids while contributing to healthy circulation. * Drink a cup of hot tea a day. Complete with instructions and a dietary regimen. What’s The Difference Between the 10-Day Blood Cleanse and the Full Body Cleanse? Take formulas and tea daily along with a modified diet that is provided in the instructional booklet with a full glass of water. 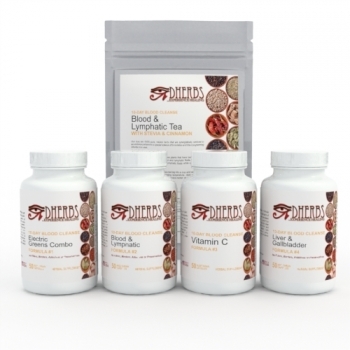 If you're trying to help address an issue within the blood, we would recommend starting off with the 10 Day Blood Cleanse. The Full Body Cleanse detoxes all of your major organs including the skin, our largest organ. The Blood and Lymphatic formula in the Full Body Cleanse helps remove impurities from the blood that appear in the skin. It's always recommended to start with the Full Body Cleanse unless you're trying to address a specific issue.